Do you know how much money you spend in a month? Do you know the percentage of your spending on different categories like house hold, food, entertainment or health/medicine? It is advisable to keep an eye on the income and expenses. This will help you be aware of your financial situation and you will know how much you need to save for future needs. Technology touches life, in good old days people were using notebook and pens to track and calculate monthly expenses and saving. Than we used excel based tool to track expense. Today technology has shrunk the world on our 3X2 inches mobile screens. Everyone wants everything on mobile. Yes we can track our expenses, set payment reminders and manage bills all with a few taps and clicks with a variety of applications available for smart phones. 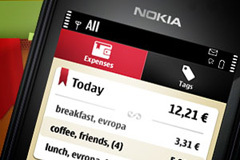 Here are free smart phone apps to manage your money in better manner. Just feed in your expenses and income and you will be able to track the same on a daily, monthly and yearly basis. Schedule payments and recurring payments like electricity bill. Automatically add expense is to defined category. For example if you have a category like “Utilities” then payment towards electricity bills would be added to this category. Get alert for payment dues. Generate dynamic reports. You can also export the data to excel files to do more analysis. Data can be stored SD card & Dropbox account. This apps also has paid version Toshl Finance pro, Incase if you are ready to purchase Toshl Finance Pro than you can have advantage of adding multiple incomes, advance fancy graph facility, searching within expense you can also export this report in Excel, pdf or doc. You can download these Apps from Google App store. There are many apps available in google play app store like Expensify, Manila, Perfios, Quicken or Mint which allow you to manage your entire personal finances. You can manage your portfolio, manage your bank accounts and do a whole lot of other activities. Do you use any mobile app to manage your money? Do share your experience via comments.